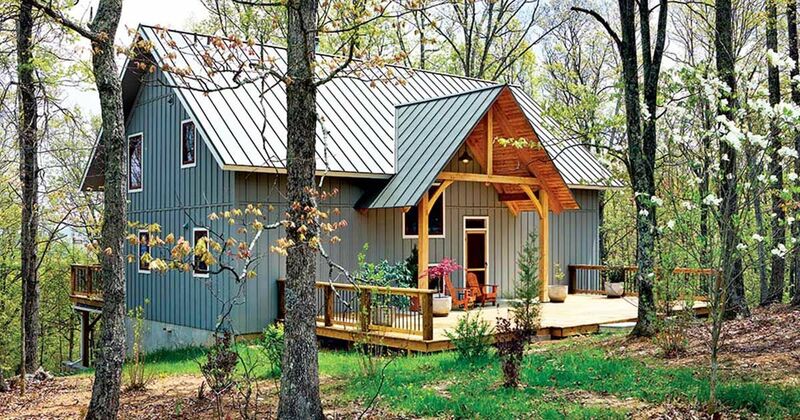 Log cabins and timber homes represent an opportunity to get away from the big city as they are often located in the most beautiful and peaceful natural surroundings. Whilst many wooden retreats focus on the rustic nature of this back-to-basics living, it is not for everyone, with others preferring more contemporary design features. Who is to say that you cannot have it all? Imagine an idyllic wooden retreat, set in a gorgeous natural location, with an interior that features the best of modern design. 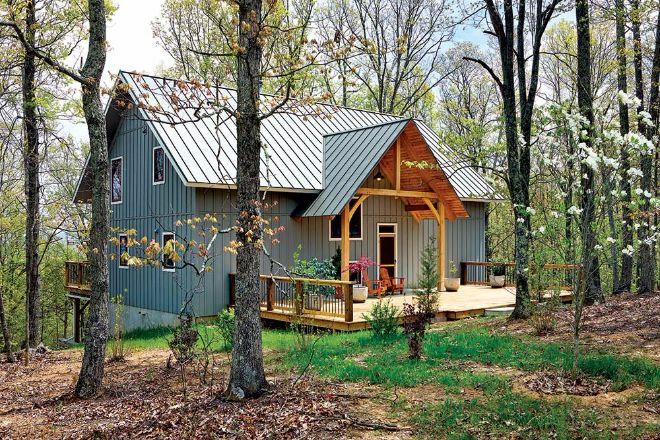 Welcome to Dancing Oaks Lodge by Blue Ridge Timberwrights: a custom-built timber home located in the heart of the Blue Ridge Mountains of Virginia. Dancing Oaks Lodge has an attractive shade of blue which doesn't seem out of place in its natural setting. The oversized cover at the front door spectacularly frames the entrance to the house. The rear of the house has two large gabled dormers which give great light to the upstairs level. 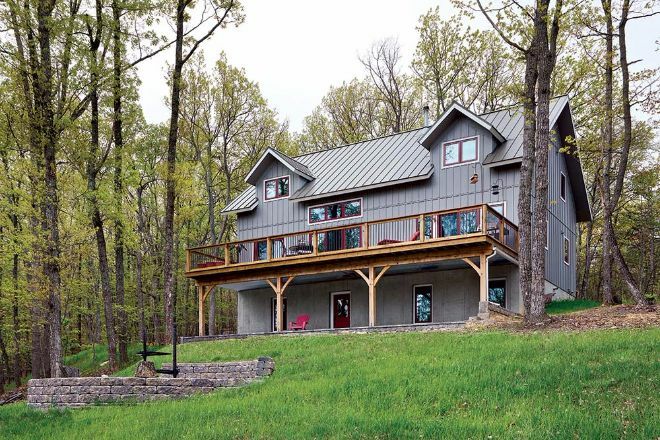 The deep porch with its raised elevation creates majestic views of the peaceful woodlands. 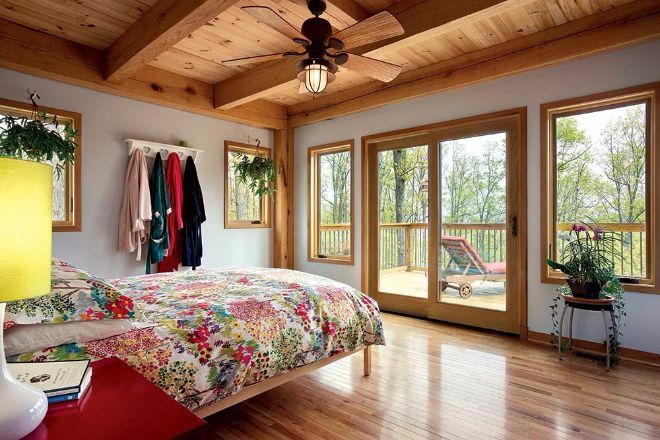 Dancing Oaks Lodge has three bedrooms and two bathrooms over approximately 2,000 square feet of internal living space. Let's take a look inside and explore the contemporary interior of this charming woodland retreat. The awe-inspiring great room features a lot of windows and a soaring cathedral ceiling. With interior walls kept to a minimum, the house maximizes on natural light from 360 degrees. 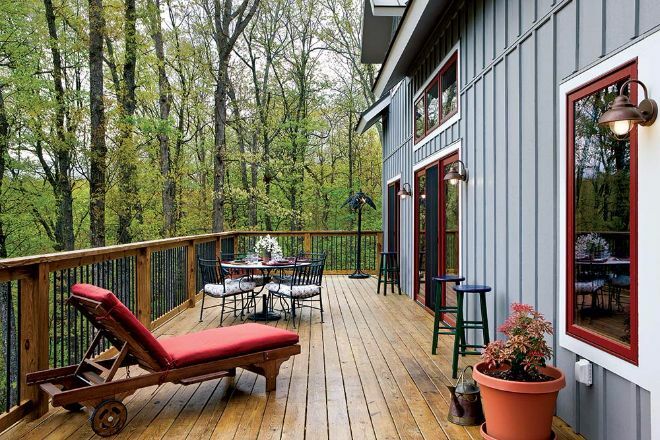 The finishes are contemporary, yet not out of place in this woodland setting. 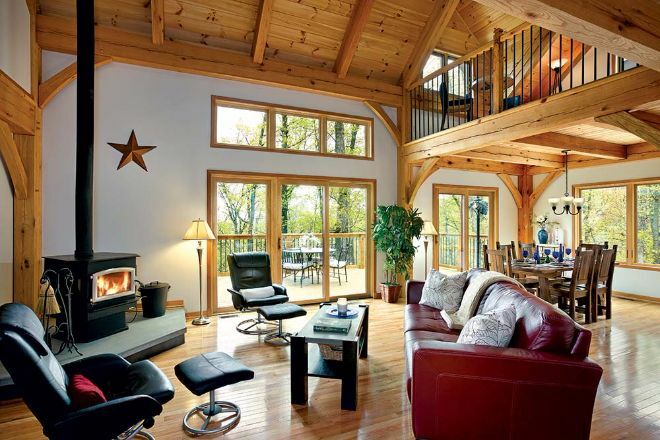 The wood-burning fire and exposed beams are a gentle reminder of the back-to-basics lifestyle. The spacious kitchen within Dancing Oaks Lodge has an incredible amount of workspace when compared to traditional timber houses. The white walls and kitchen cabinets are typical of a contemporary home and serve to increase the amount of light which fills this house. 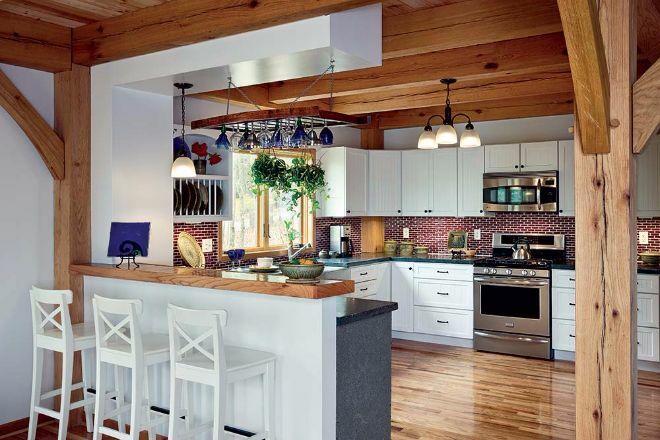 Custom features including concrete countertops and brick-inspired tiling add personal flair to this outstanding kitchen. The open concept living room, kitchen and dining room is a well-thought-out and finished living experience. The beautiful grain of the timber beams is accentuated by the white walls throughout this home, whilst gorgeous hardwood floors in every room perfectly finish the house. 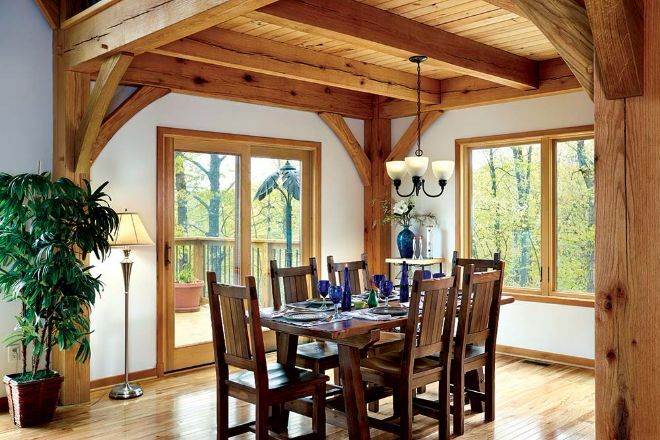 The dining room has amazing woodland views and access to the rear porch. The main bedroom in Dancing Oaks Lodge is situated on the ground floor of the house, again benefiting from a wealth of large windows to perfectly capture the woodland panorama. Sliding doors allow the cool breeze to enter the room, whilst giving residents direct access to the porch. 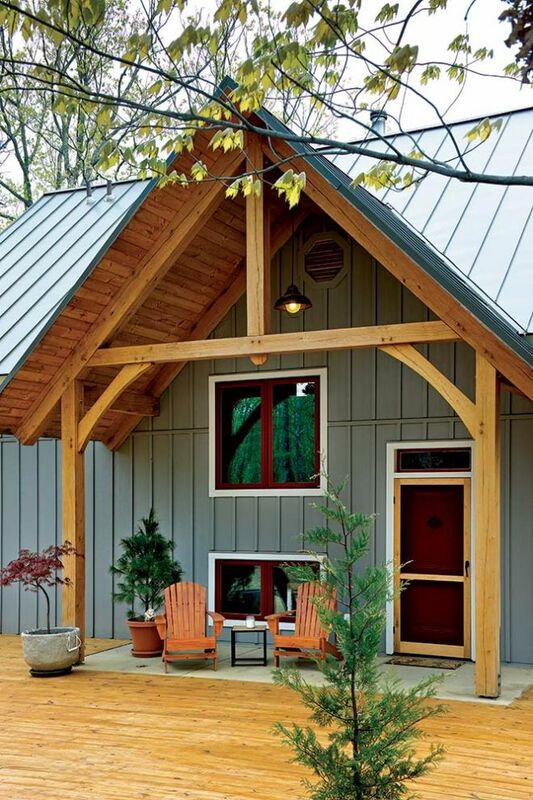 The large porch, situated at the back of the house is the perfect place to relax and enjoy the quiet ambiance. It can be accessed from the bedroom or the dining room, and is finished with a dining set which is ideal for entertaining on sunny days. 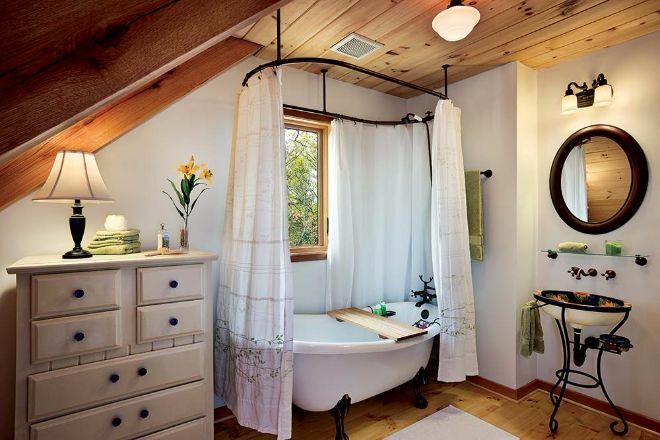 The minimalist style of the ground-floor bathroom is a delight for those with an eye for interior design. 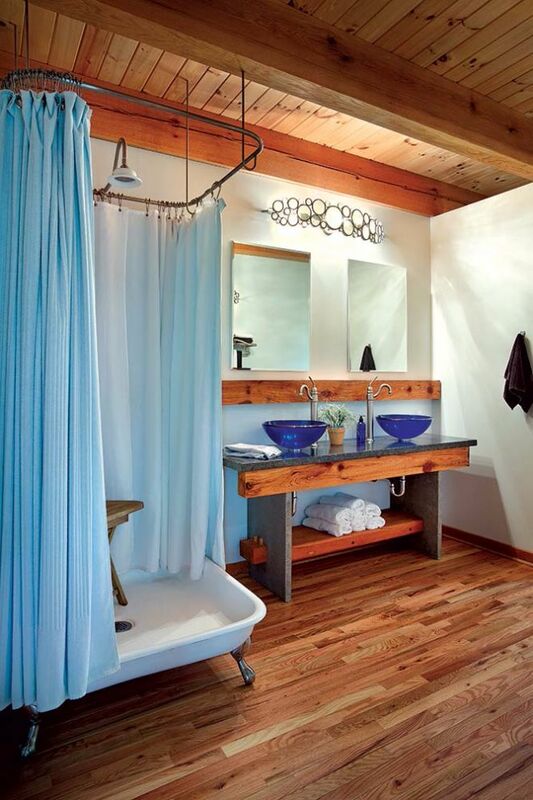 The claw-foot shower, cobalt blue glass sinks, and elegant antique-style taps make this room a genuine pleasure to behold. 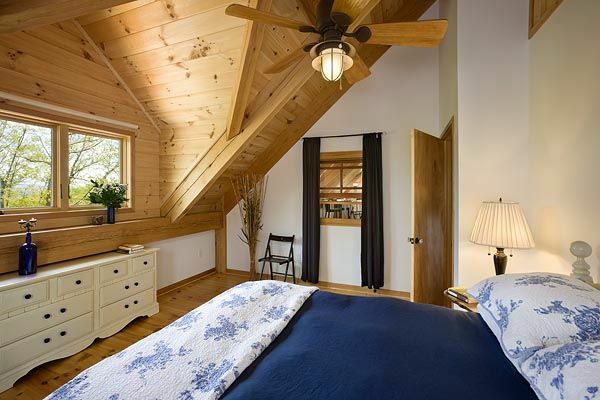 Upstairs, the second bedroom in the house benefits hugely from an oversized gabled dormer. What an incredible difference it makes to the light and air in the room, making it much more spacious and bright. The upstairs bathroom, again, boasts terrific finishes which would not be out of place in a contemporary style magazine. The claw-foot bathtub and free-standing sink are unique and interesting finishes which are as attractive as they are functional. 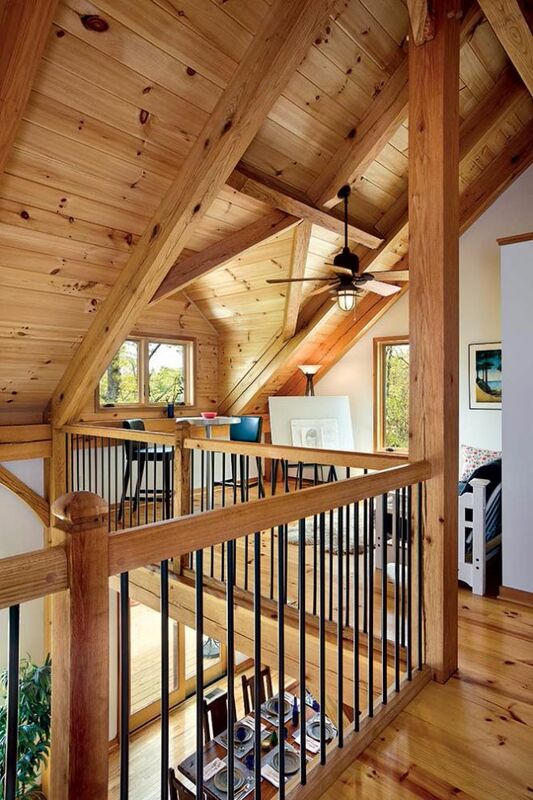 No timber home would be complete without a loft space, and Dancing Oaks Lodge does not disappoint on this. Bathed in natural light, this is the perfect place for quiet contemplation. Do you like the contemporary finishes in this timber home? Like and Share on Facebook!